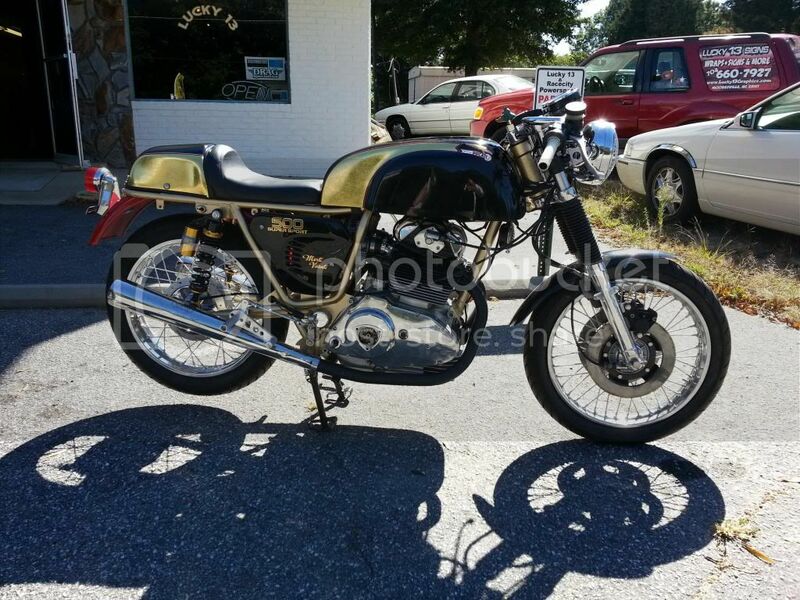 Post pictures of your Parallel Twin Ducati along with a description here. with it. Restore it to original, just get it running and use it to beat around or make a cafe racer out of it. 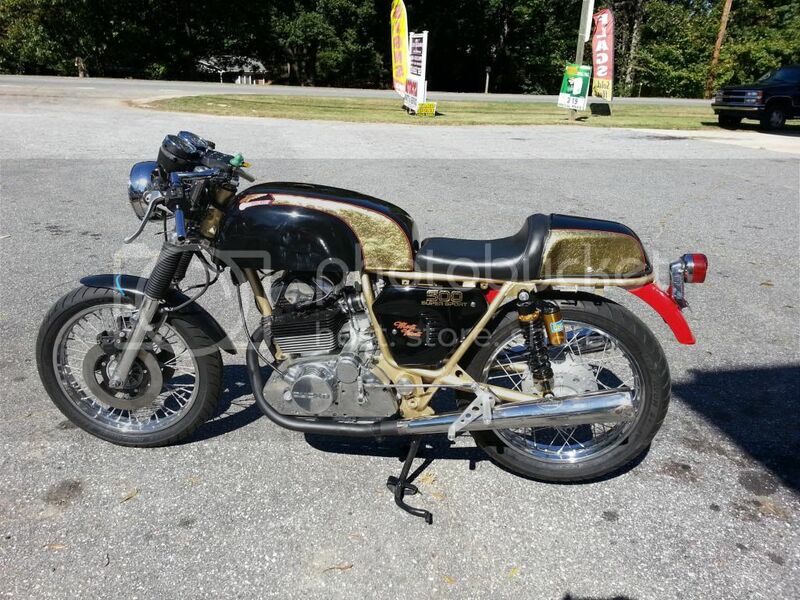 I finally decided after pulling it apart and polishing some parts that it needed to be a café racer project. The first thing I did was to make sure the engine was solid. After changing the points and some marvel mystery oil the engine came to life. Though the compression was down It was running. No oil leaks and running I was confident we had a winner. After about 30 min of running I check the compression at it was just about up to spec. I was very happy to see that. So Dis assembly began. Starting with the engine and before I knew it she was down to a bare frame. Lots of cleaning and replacing nuts and bolt was ahead of me. The first pictures are how I got her. She was rusty but complete. 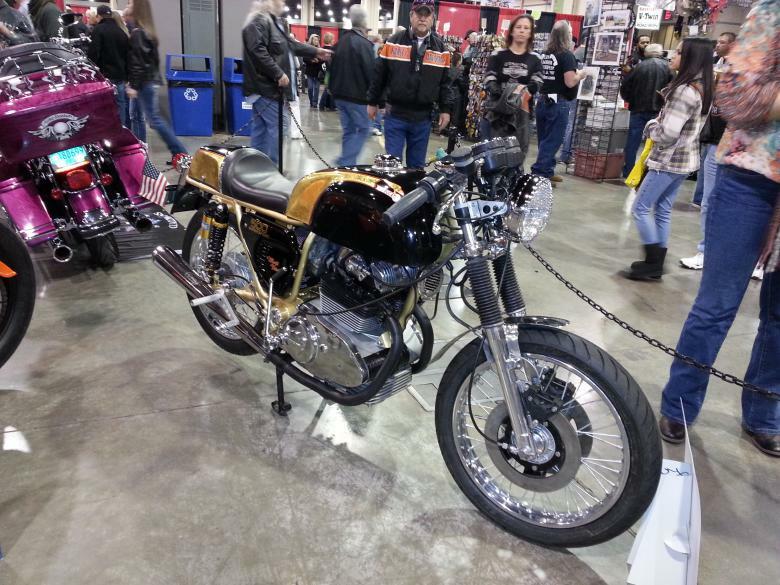 I like the idea of a cafe racer...!! Ok the first day of working on her most of the day. I got the engine out now it's time to degrease the roller. 36 years of nasty grease and grime. It's like cement won't come off time for the pressure washer! lol. Someone left this poor bike out in the weather for decades. Lots of cleaning and polishing in my near future. Finally got the frame clean and stripped down. Its off to sandblast and paint. The frame will be metallic gold with black tank and seat. Im not sure what style of tank and seat yet. The engine was the next target. Soda blasting and cleaning is the first thing then panting and polishing. I know these Ducati 500 Parallel twin engines don't have the best reputation. I found Chris Bushell on this board. He is by far in my opinion the very knowledgeable about these bikes. Although he is in the UK and I'm in the US we communicated through email. Chris told me all the things to check and even sent me a workshop manual for the bike. Come to find out the oil filters are no longer made for these bikes Chris custom made me a oil filter bolt to adapt a common filter on the bike. This guy is the best! Chris also gave me the serial numbers of the engines that had problems and lucky for me my engine is a newer one and Ducati had made some changes to fix those early problems. I have about 15 hours into the engine and frame so far including checking all the things Chris told me (everything looked great inside the engine), paint, new gaskets and polishing all the aluminum. The engine came out very nice and just needs a few more things to be finished. Next all the small parts need to be blasted and prepped for powder coating. I never thought it would end It felt like I was sandblasting for a week lol Every nut and bolt ,brackets, hubs and rotors etc... More pictures to follow. Thanks for reading More to follow. Last edited by Lucky13 on Tue Oct 01, 2013 9:34 pm, edited 2 times in total. It would be good to be able to see pictures, but i cant! Some Before and After Pictures, I finished detailing my wheels and mounted up some new Avon tires. Polished the forks and triple trees. I got the frame and swing are finished. It's starting to take shape. The next step do I put clip ons or clubman bars. Im leaning toward clubman bars. I've got the LED dash refinished and the bars will go on next. Just started to wire the bike too. I did get the tank and seat sorted out. 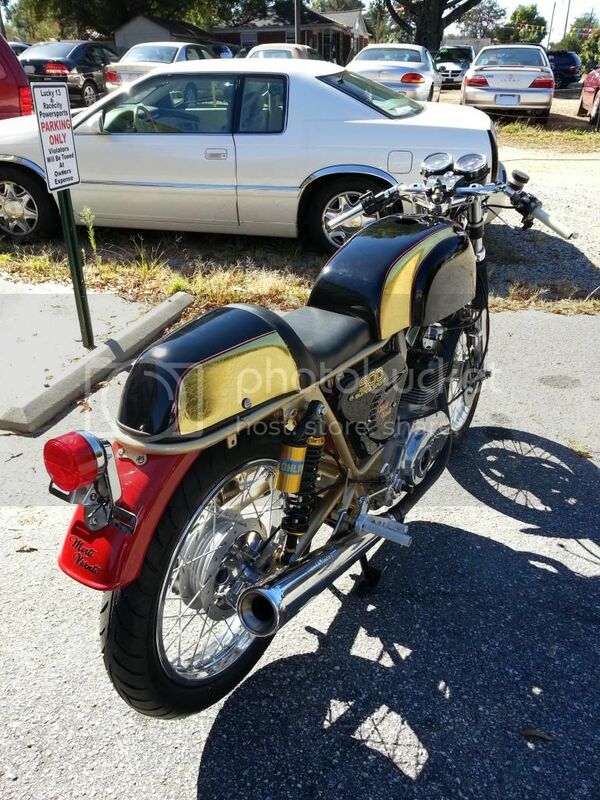 I picked up a Manx TT tank from legendary motorcycles and a replica Ducati 900SS seat. Also got a rear fender from a Ducati 500SD with a little modification it fit right on. The rear taillight is a CEV and bracket is a repot for a 900SS. I really like the combination. I think everything flows very nice. I'm still not sure about the paint yet. I also got the rear sets mounting figured out. I welded a 10mm threaded rod to a coupler so my rear sets could bolt to my frame at the same point as the exhaust does. This seems to be a good riding position. I machined the original shift lever to accept the linkage from the new rear sets and everything lines up perfectly. The brake pedal was a different story. I was going to modify the original brake pedal but after looking at it for a while I decided to fab a completely new brake lever. I also found a knob for my steering damper. I converted a zombie duck bobble head into a knob. I got the wiring in but not hooked up I guess that's the next step. It looks really good, iam sure it will end up a really nice bike! Waiting for more pictures! Finally almost done! Need to install chain, chain guard, grips, gas cap, petcocks, graphics and I'm sure I am forgetting some things. But she's almost ready! I decided after all to make the tail black and rear fender black too. So still some work to do. Also need to chop the front fender. Last edited by Lucky13 on Wed Oct 09, 2013 1:14 pm, edited 1 time in total.